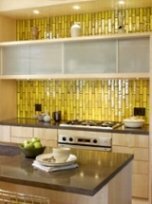 Backsplash Tile Designs . . . Boundless Backgrounds! 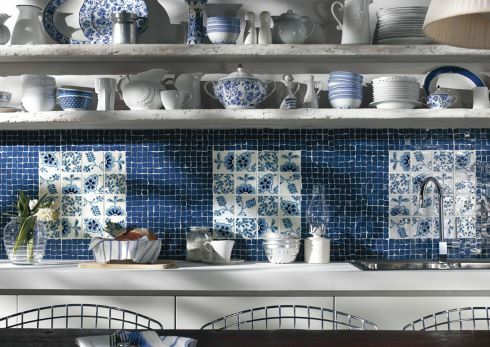 The vibrant backsplash tile designs featured here will be a focal point in any room . . . whether a kitchen, bath, or other special space in your home. 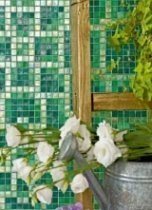 Crafted from a variety of materials including ceramic, porcelain, glass and mother of pearl, the tile designs encompass a broad range of styles, patterns and textures. 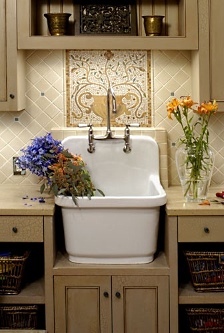 A brilliant glass tile backsplash turns to nature for inspiration. 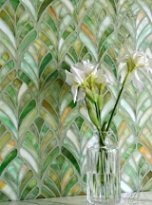 Named for a delicate French herb similar to parsley, "Chervil," pictured here, is from Sicis' Natural Mosaic Collection. 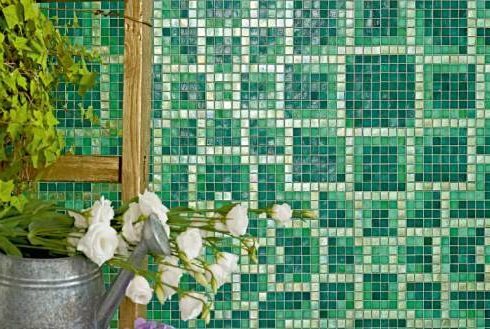 Hues of green and blue infuse the tile designs that follow. 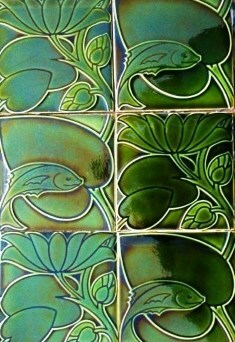 Below, left, a fish and leaf motif adorns a series of beautiful antique tiles from Hill House Antiques in West London. Dating from 1900, they were designed by British architect Charles Voysey. 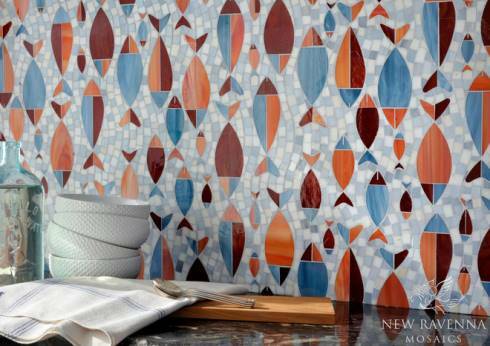 A more recent tile design (below right) hails from Avenue Mosaic, based in New York City. 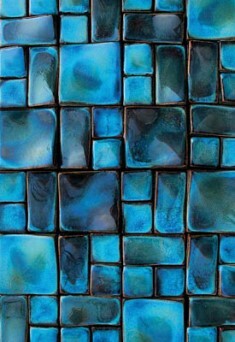 "Cold Spring" is a richly colored ceramic tile pattern from the firm's Walden series. 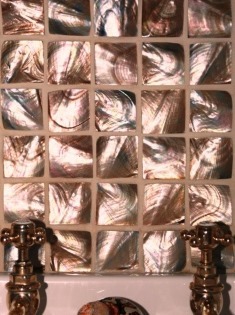 More Backsplash Tile Designs . 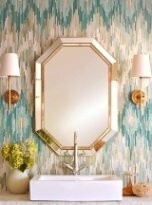 . .
A sea of blue provides a striking backdrop for contrasting tile panels in a contemporary interpretation of traditional majolica from Marca Corona's Petite Maison collection. 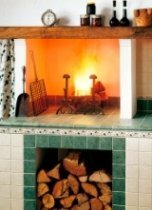 The ceramic tile backsplash is pictured here in "Bianco Fiore." in Mica, Sardonyx, Garnet, Pearl and Quartz. 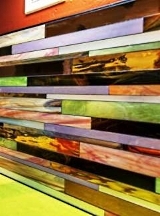 A fiesta of color infuses a kitchen tile backsplash from Clay Imports' Alhambra series. 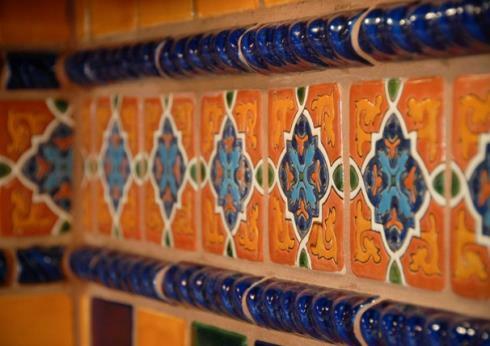 The raised ceramic tiles are made in Mexico and feature Spanish and Moroccan motifs. 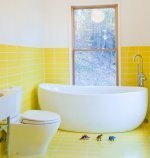 The selection of bathroom tile patterns and materials continues to grow with rapid advances in technology and manufacturing techniques. Our perception of con- ventional tile options no longer applies. So-called boundaries are becoming boundless! Despite its name, there is nothing plain about The Plain Collection from Maybury Home. 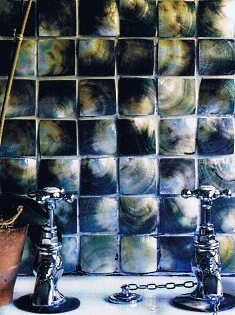 The British firm's hand-crafted mother of pearl tiles are rich in color, pattern and texture . . . . . shown here in "Plain grey" (below left) and "Plain brown" (below right). 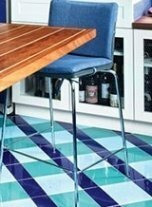 The unique patterns and textures of Kente cloth, an icon of African cultural heritage, are beautifully captured in a glass tile line from Tohickon. 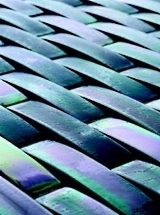 Pictured here in "Wormwood Blue," Kente comes in a variety of vibrant colors. A finely crafted dimensional tile backsplash by Michael Allen Mortensen of Palmer Todd, Inc. transforms a bath into a veritable work of art. The design firm is based in San Antonio, Texas. Musician Lenny Kravitz teamed up with tile producer Lea Ceramiche to create Goccia -- a three dimensional ceramic tile series. 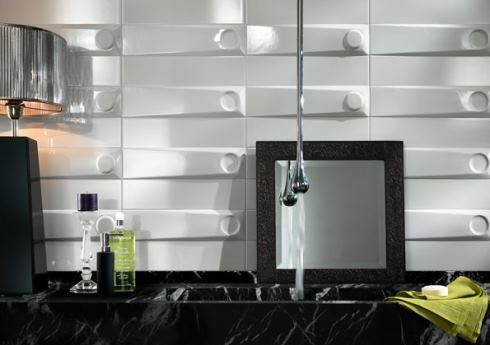 The ultra-modern tiles are available in black and white with a glossy or matte finish. 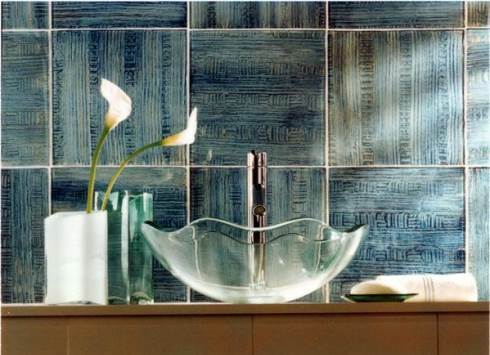 With a little creativity, any room can be enhanced with tile. 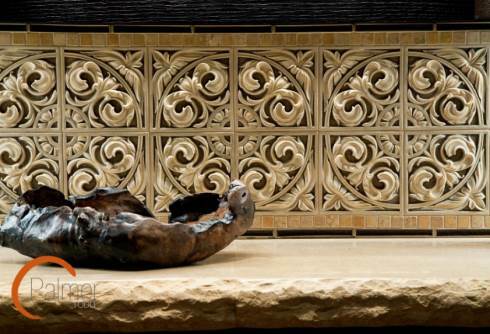 A "bedroom backsplash" from Bedrosians makes a dramatic focal point in the design below. 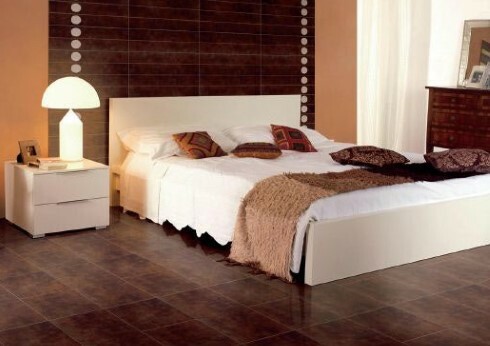 The porcelain tile, shown here in "Cherry Cola," is from their Metro Series. 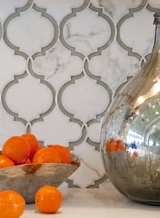 Please check back often or subscribe to our RSS feed, as we frequently add new backsplash tile designs to our site.